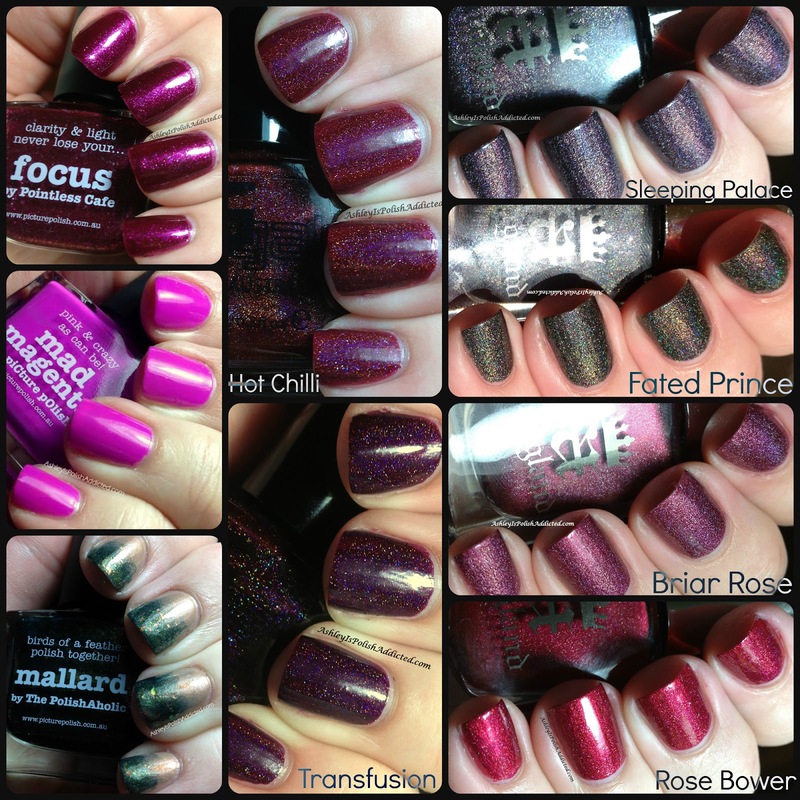 Ashley is PolishAddicted: Favorites of 2013 Round-Up! Happy 2014 lovelies! I'm sorry I have been so absent lately. I got sick and it stayed with me for 2-3 weeks and just as I thought I was getting better it hit me again. 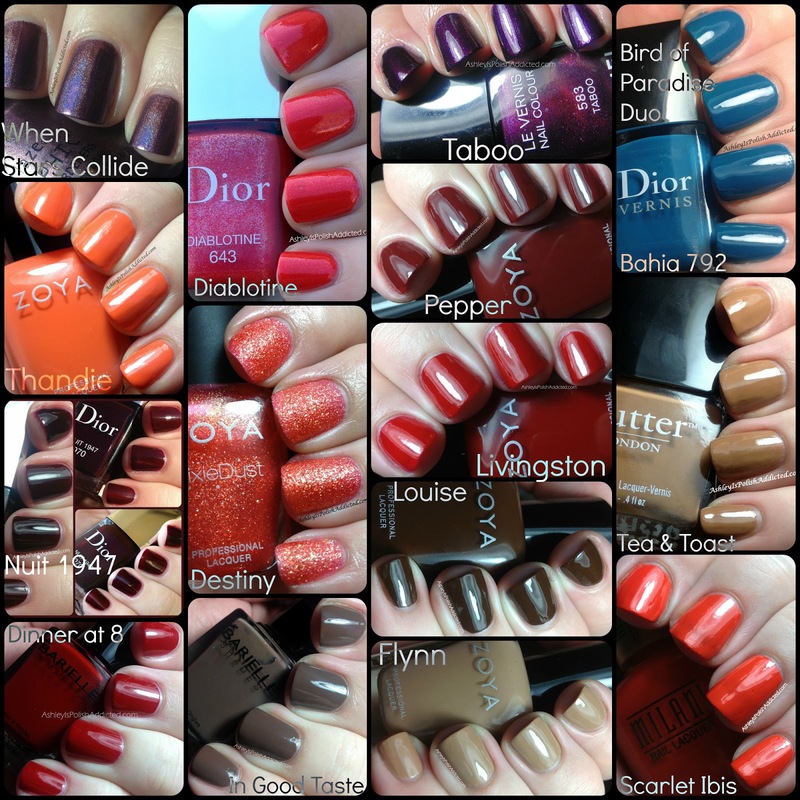 I have been working on this particular post for 3 days off and on and I am so happy to finally share with you my personal favorite polishes from last year! If you've been following me a while you probably know that I am really bad at narrowing down collections and choosing favorites. Like, really bad. Sometimes some will capture my heart and be the standout of the collection. Other times I truly like each and every one and just can't choose! Haha! So, I had a huge list to start with and had to narrow down quite a bit. I narrowed until I couldn't narrow anymore. Since I still have a longer list than some, and because I'm not breaking up each "category" into separate posts, I have made collages for each category. I was planning on linking them all but when I got sick and it started taking me so long that went out the window. I have posts on most of these and you should be able to find them in my Label Widget on the sidebar. But, if there are any you have questions about please leave me a comment and I will happily reply! Carrie (and hubby, Rick!) have been cranking out the collections this year. And not only are they cranking them out, they are stunning! 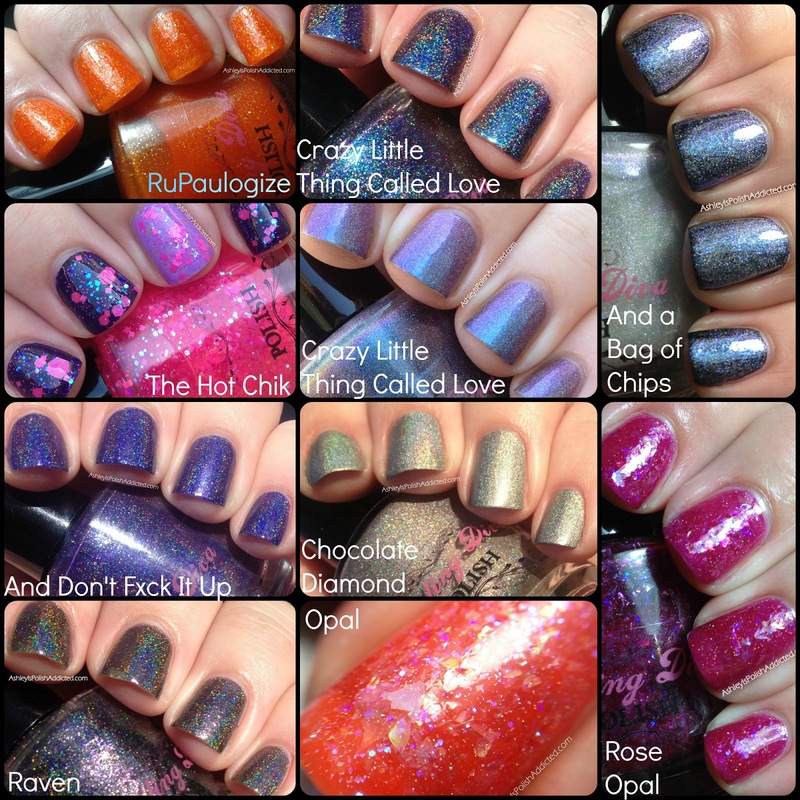 From holos to multichromes to glitters to flakies and everything in between, they are all so pretty and the formulas are always wonderful. They have excellent customer service and super fast shipping too! I can't wait to see what is on the horizon for this brand! 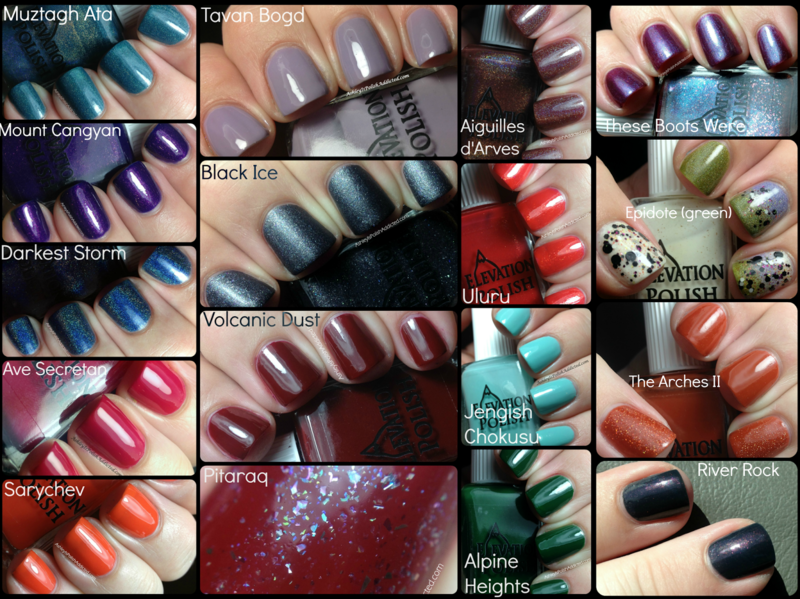 Elevation Polish has really exploded this year! Lulu, the creative genius behind Elevation, just keeps coming up with amazing new collections. I don't know how she does it! All of the polishes are inspired by nature and all of the amazing sights she has seen in all of her hiking adventures. I think my favorite thing about Elevation Polish is the variety, there is something for everyone (not to mention how amazing all of the formulas are)! The organization of the restocks is great because you always know when to expect new polishes (and there is nearly always enough regular stock that you don't have to fight over your favorites). I am anxious to see what Elevation Polish brings us in 2014! One more category for you! 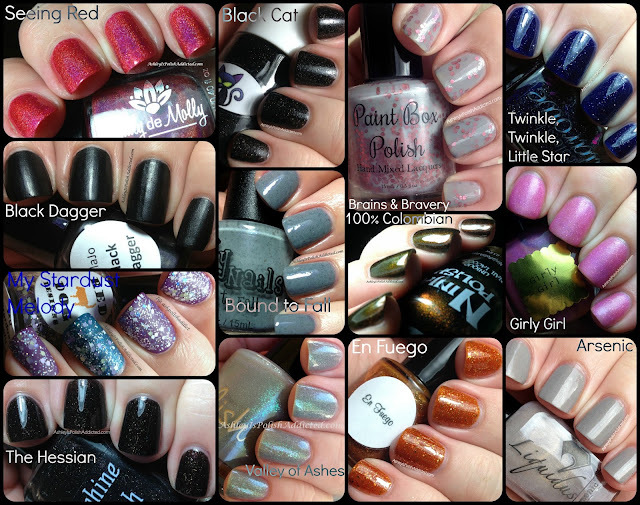 The following polishes are other favorites I obtained in 2013 that were either customs or were released prior to 2013. 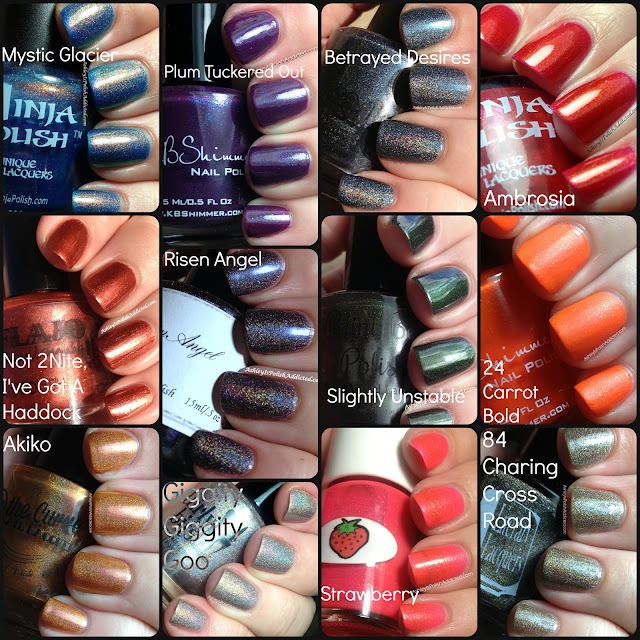 Even though they aren't technically 2013 polishes, I still wanted to share them with you! Well there are my favorites for the past year! Are any of them the same as your favorites? I'd love to hear your standouts in the comments! Oh, Some of these are my favorites too. And some are now on my wish list! I have seen sooo many top of 2013 posts (and am currently working on mine) but yours has one that is at the top of my fave list but I have not seen in others....Bound to Fall. I absolutely LOVE it and have worn it for several different looks this past year! Thanks! I am surprised it's not been featured more as well. I agree. Bound to Fall is one of my favourite Dandy's along with Chill Down. Great choices! I love how you presented everything in collages! Wow, thank you so much for including Girly Bits among your favourites. What a great selection here!!! You have amazing polishes, Pam! Very belatedly - nice picks!